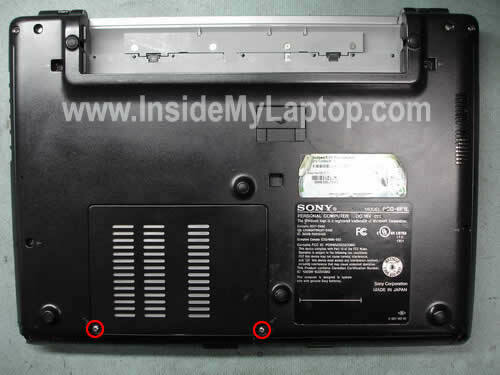 Remove two screws securing the cover on the bottom. Under these cover you’ll find laptop memory and wireless card. 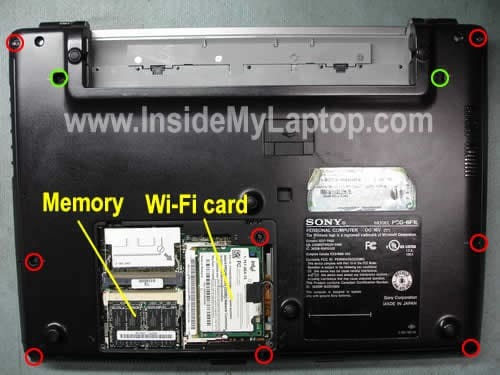 This model has two memory slots accessible from the bottom but unfortunately you cannot use regular notebook RAM modules. You’ll have to use PC2700 DDR333 microDIMM. I believe you can install 1GB total. Up to 512MB module into each slot. 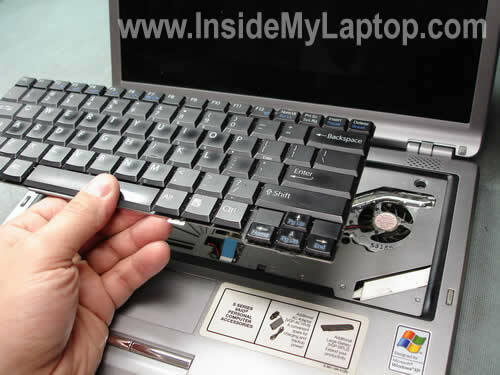 If you are replacing the keyboard, remove only two green screws and proceed to the next step. These two screws secure the keyboard. If you are taking the whole thing apart, remove all screws – red and green. 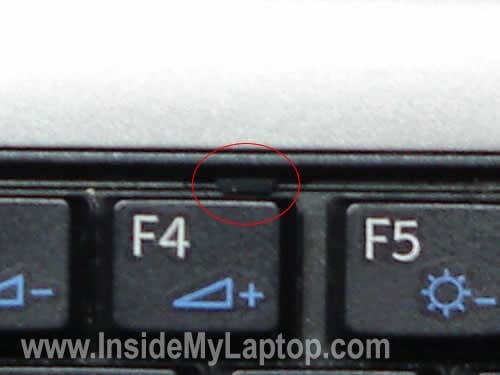 There are two spring loaded latches above F4 and F12 keys. Carefully release these latches with a small flathead screwdriver. 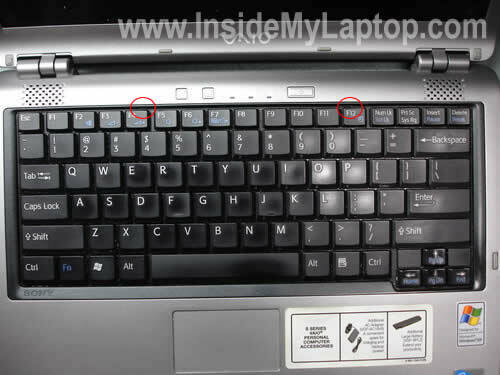 After the latches has been released, you can lift up the keyboard as it shown on the picture below. 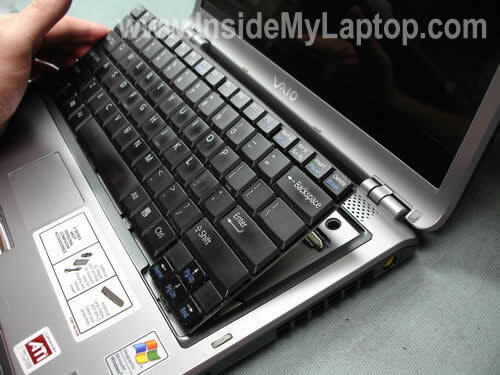 Turn the keyboard upside down and place it on the palm rest. In order to remove the keyboard you’ll have to unlock the connector first. Remove four five screws securing the top cover assembly. 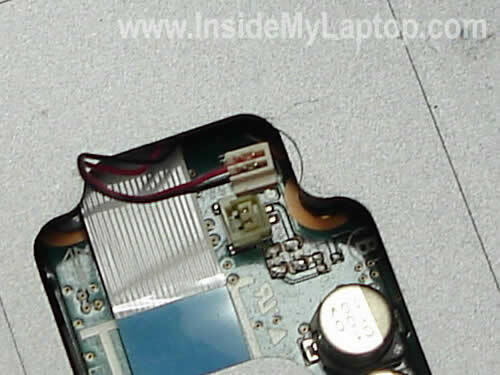 (I forgot to circle one screw which is located on the right side from the touch pad cable). 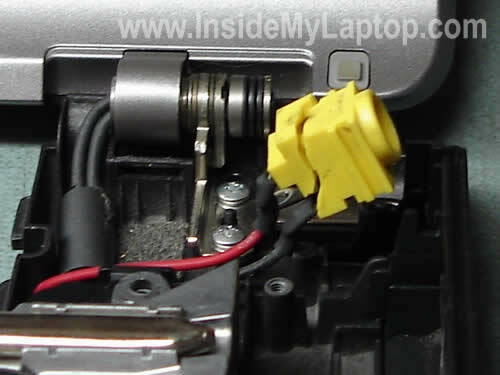 Unplug two speaker cables (green), the touch pad cable (red) and the power button board cable (yellow). Here’s a closer shot on the speaker connector. Now you can lift up and remove the top cover assembly. The top cover assembly has been removed. 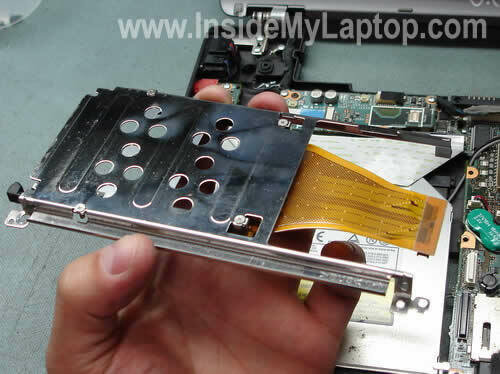 Remove two screws securing the hard drive assembly. Unplug the hard drive cable from the motherboard. 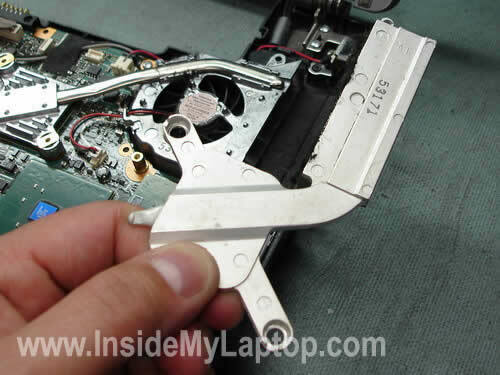 Remove the hard drive assembly. 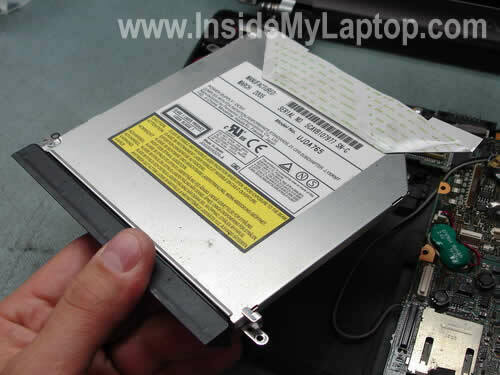 If you are replacing the hard drive, you’ll have to remove the mounting bracket with the cable and transfer it to a new drive. 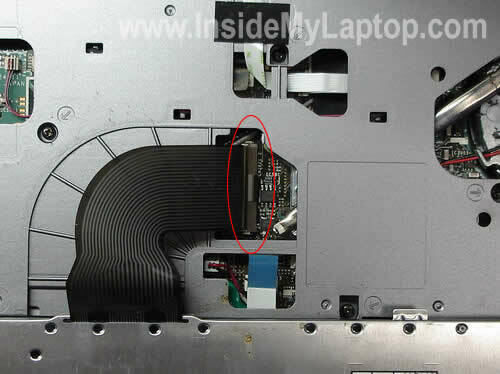 Before you can remove the CD/DVD drive, you’ll have to remove the PC card slot. 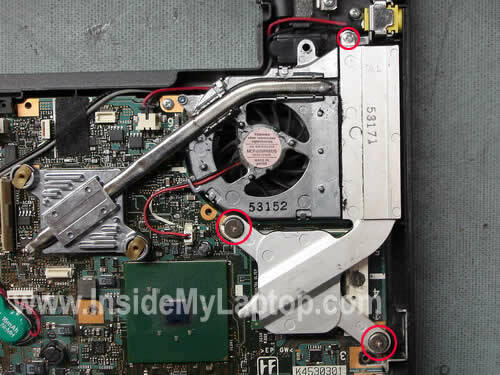 Remove one screw securing the slot and unplug it from the motherboard. 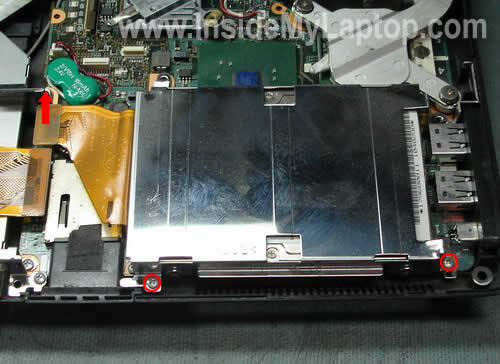 Remove the PC card slot assembly. 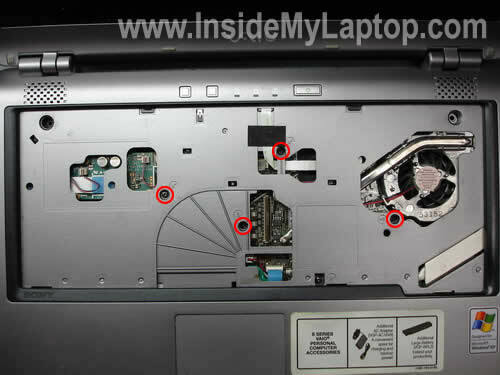 Remove four screws securing the CD/DVD drive assembly to the laptop base. Unplug the cable. 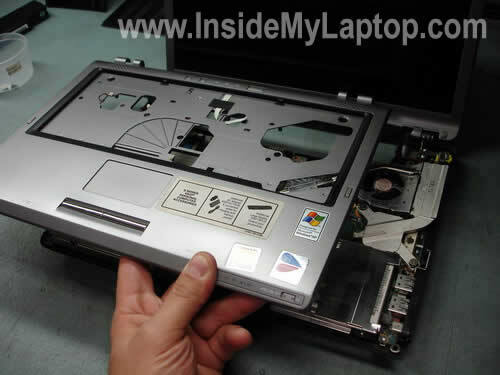 Remove the CD/DVD drive assembly. If you are replacing the drive, you’ll have to transfer the face plate with the cable and mounting bracket to a new drive. 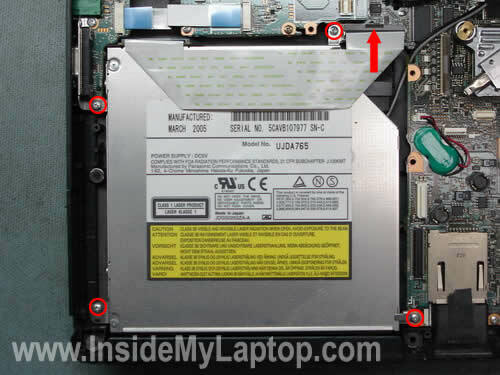 Remove three screws securing the CPU heat sink. Remove the CPU heat sink. 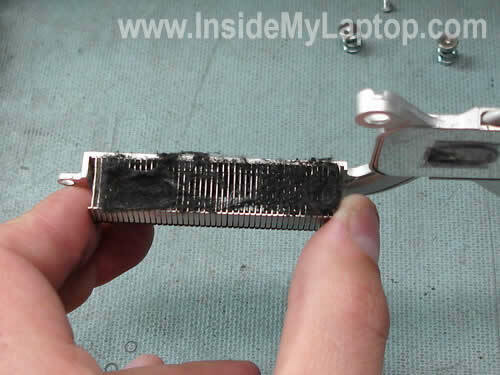 If the heat sink is clogged with dust blow it off with compressed air. 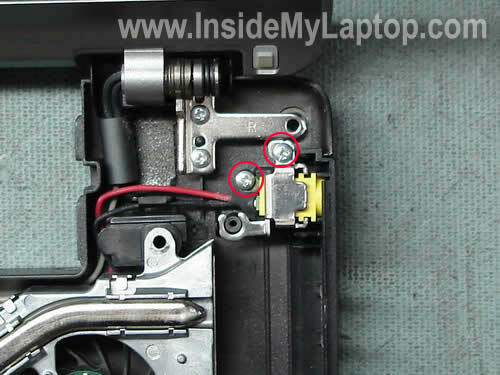 Remove two screws securing the DC power jack. Remove the mounting bracket and release the jack. 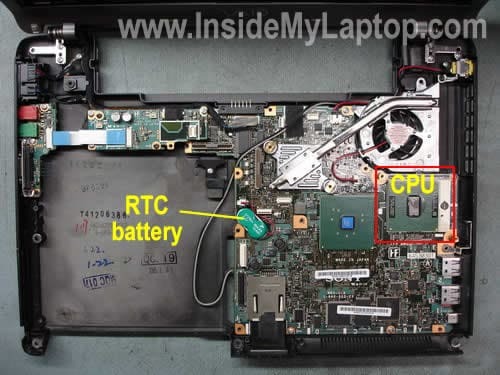 As you see on the picture below the power jack in my laptop is broken in two pieces. I’m going to replace it with a new power jack. I will unsolder the broken jack and solder a new one. 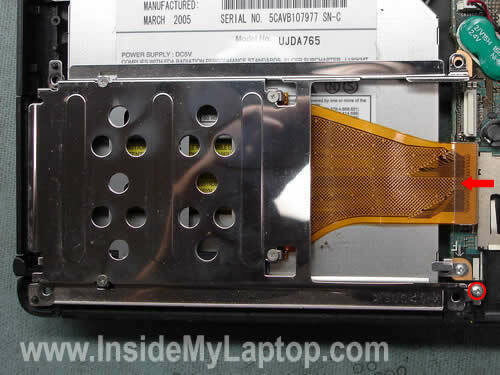 Before you install the heat sink back in place, you’ll have to apply new thermal grease on the top of the CPU.